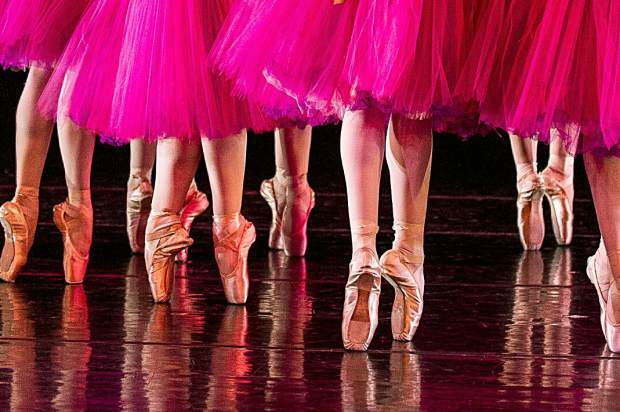 Ballet slippers during the "Waltz of the Flowers" for last year's Aspen Santa Fe Ballet dress rehearsal of the Nutcracker. A scene from last year's Aspen Santa Fe Ballet dress rehearsal of the Nutcracker. 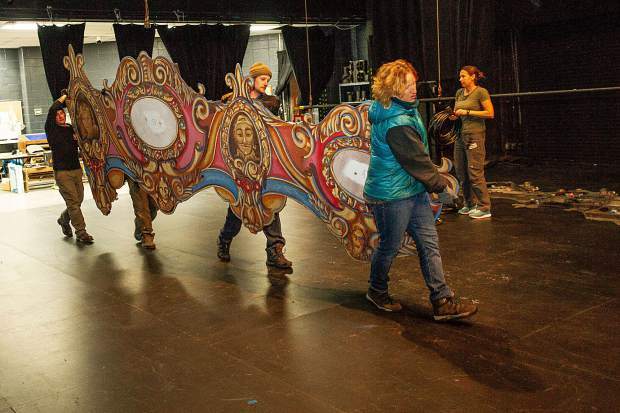 Production crew members, Kate Redmond, front, Cody Kosinski, Kyle Pieti, and Brock Jacobson unload one of the set pieces in preparations for the Aspen Santa Fe Ballet's, "Nutcracker," on Dec. 1. 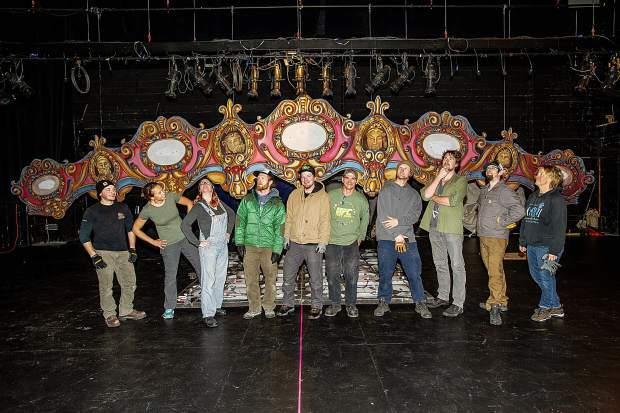 Production crew members for the Aspen Santa Fe Ballet's, "Nutcracker," on Dec. 1. 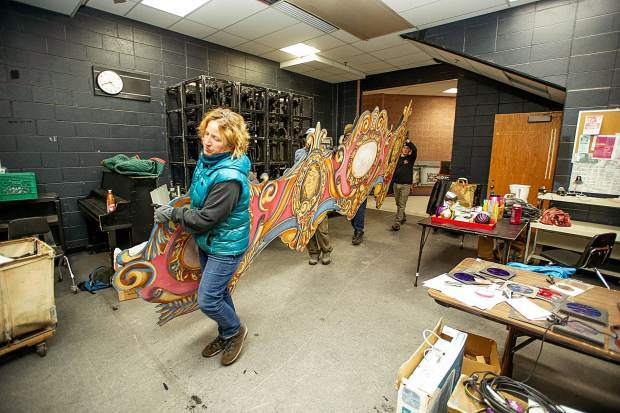 Production crew members prepare one of the set pieces in preparations for the Aspen Santa Fe Ballet's, "Nutcracker," on Dec. 1. Pete Leo Walker and Anna Gerberich rehearsing The Nutcracker last year for the Aspen Santa Fe Ballet. 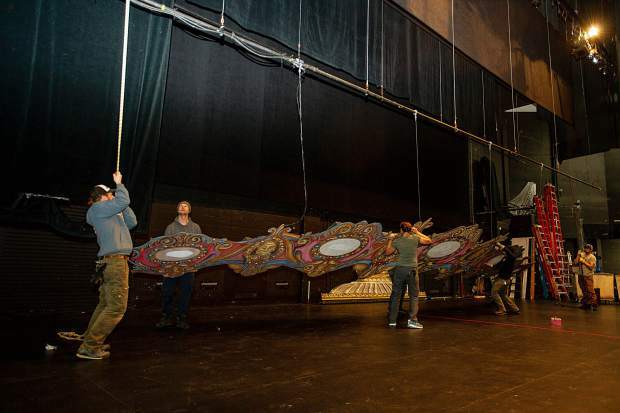 Crew members hoist up one of the set pieces in preparations for the Aspen Santa Fe Ballet's, "Nutcracker," on Dec. 1. 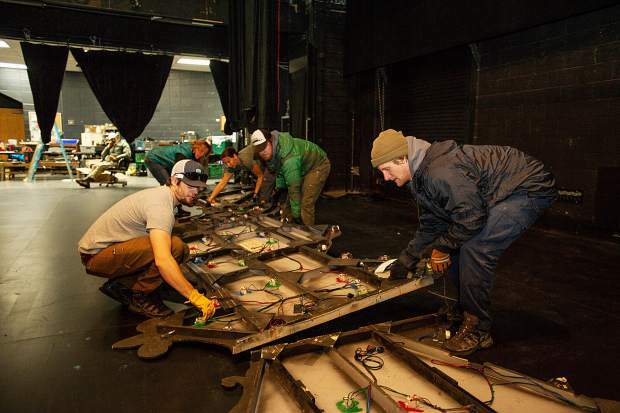 Aspen Santa Fe production manager Danny Bacheldor uses his body weight to hold down a set piece while preparing the Nutcracker set on Dec. 1 at the Aspen District Theater. 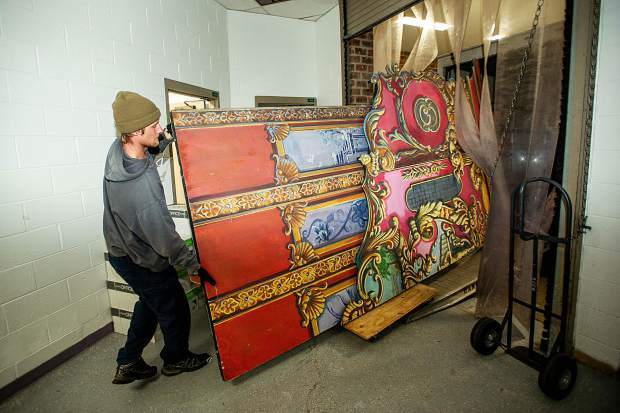 Production crew member Cody Kosinski unloads one of the set pieces in preparations for the Aspen Santa Fe Ballet's, "Nutcracker," on Dec. 1. 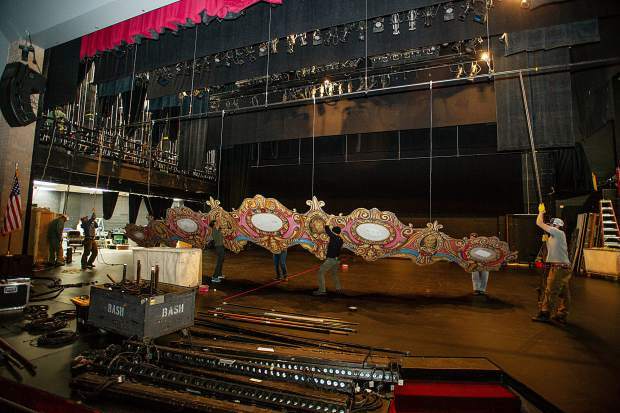 When: Saturday, Dec. 8, 2 & 7:30 p.m.; Sunday, Dec. 9, 1 & 5 p.m.
Before any dancers stepped on the Aspen District Theatre stage this week for final rehearsals of Aspen Santa Fe Ballet’s annual staging of “The Nutcracker,” a 12-person crew had put in upward of 1,000 man-hours to create the magical world of this Christmas classic. 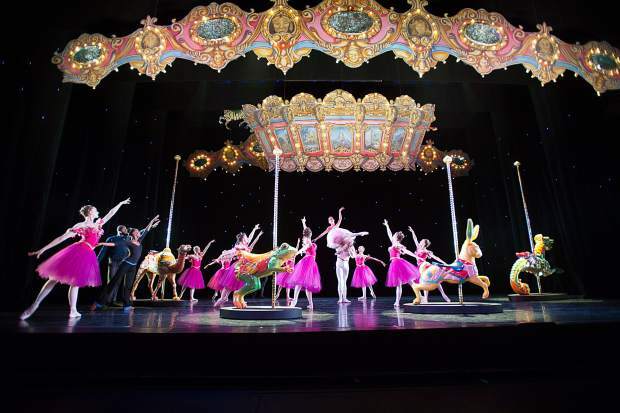 While most of Aspen Santa Fe’s contemporary works play out on sleek and minimalist backdrops, “The Nutcracker” calls for a grand production of massive sets, complex visual and sound effects and lighting schemes, countless props, glittering scenery and intricate costumes. 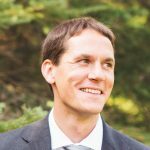 Bacheldor leads the team tasked with creating the physical world of the company’s “Nutcracker,” which runs for four performances this weekend in Aspen and another four Dec. 15 and 16 in Santa Fe, New Mexico. 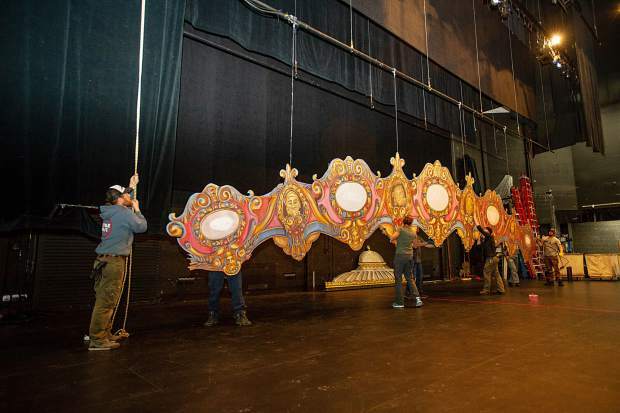 As winter begins, the production team pulls the set out of storage and pieces it together in the District, building the sparkling scene of the Stahlbaum home for the first act’s Christmas Eve scene, Clara’s bedroom and the fantastical carousel for the second act in the Land of Sweets. 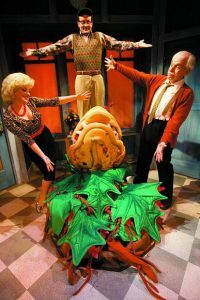 Twelve pieces of scenery hang and move above the stage — Bacheldor estimates they total about 5,000 pounds — and another six large set pieces slide on the ground level. It’s a puzzle of moving parts that the crew must maneuver precisely during the show, as the cast of 60 dances to the classic Tchaikovsky score. After the final curtain of Sunday evening’s performance, the crew will work through the night to pack up the set into a semi truck and send it to Santa Fe for next weekend’s shows in the company’s dual home. 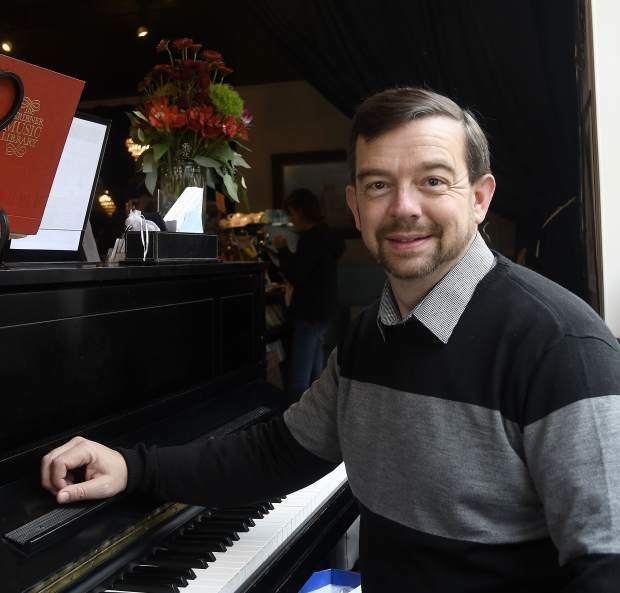 It’s an epic undertaking, but a familiar one for the production manager, whose first job was working on Aspen Santa Fe’s “Nutcracker” in 2004 while he was still a student at Aspen High School. 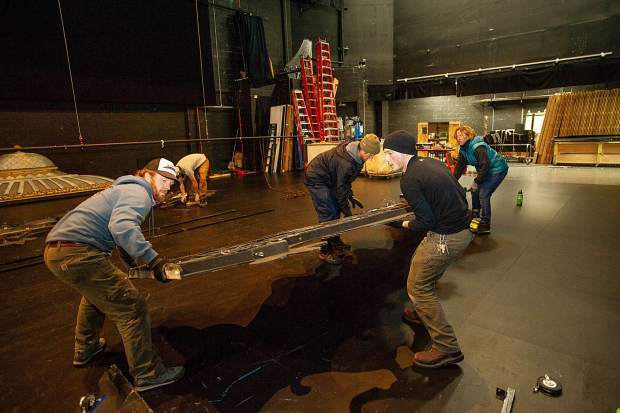 “So much goes into this before the curtain goes up on that first show,” Bacheldor said. With the sets done, the cast moved into the theater Wednesday afternoon for final rehearsals. Aspen Santa Fe Ballet artistic director Tom Mossbrucker was working through the second act with his cast — perfecting his dancers’ spacing and fine-tuning steps for the “Waltz of the Flowers.” The cast includes the company’s dancers along with guest professionals from Ballet West, the Kaufman School of Dance at USC and the Paris Opera Ballet. “It’s an extraordinary group this year,” Mossbrucker said of his guest dancers during a rehearsal break. 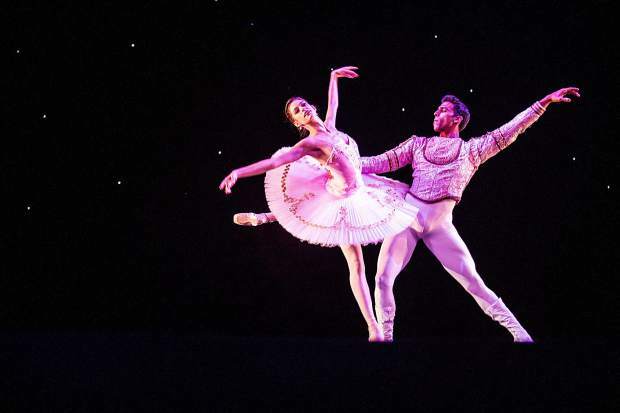 The cast also includes guest artists to perform the second act’s divertissements — aerialists, circus performers and a Chinese ribbon dancer among them — and children from the School of Aspen Santa Fe Ballet playing snowflakes, bees, dolls and soldiers. 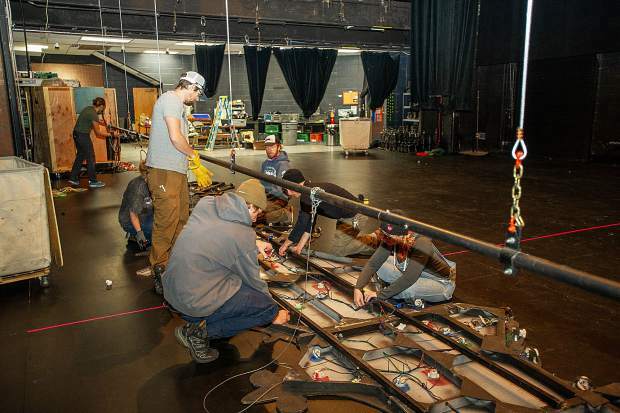 As the production crew has built and fine-tuned the sets, the professional cast has been drilling their steps in the Aspen Santa Fe studio, while the students have been working throughout the autumn on their parts. 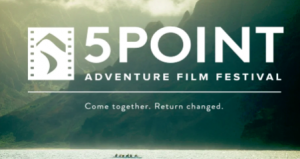 And on Saturday, they’ll all finally be joined by an audience. “It’s the magic of theater that people can show up and it doesn’t register — all the long, hard hours to get ready for something like this,” Bacheldor said.